"Drunken tree" redirects here. For tilted trees, see drunken trees. Trees in flower at the National Flag Memorial Park in Rosario, Argentina. The silk floss tree (Ceiba speciosa, formerly Chorisia speciosa), is a species of deciduous tree native to the tropical and subtropical forests of South America. It has several local common names, such as palo borracho (in Spanish literally "drunken stick"), samu'ũ (in Guarani) or paineira (in Brazilian Portuguese). In Bolivia, it is called toborochi, meaning "tree of refuge" or "sheltering tree". It belongs to the same family as the baobab and the kapok. Another tree of the same genus, Ceiba chodatii, is often referred to by the same common names. The natural habitat of the silk floss tree is the north-east of Argentina, east of Bolivia, Paraguay, Uruguay and southern Brazil. It is resistant to drought and moderate cold. It grows fast in spurts when water is abundant, and sometimes reaches more than 25 metres (82 ft) in height. Its trunk is bottle-shaped, generally bulging in its lower third, measuring up to 2 metres (7 ft) in girth. The trunk is also studded with thick, sharp conical prickles which deter wild animals from climbing the trees. In younger trees, the trunk is green due to its high chlorophyll content, which makes it capable of performing photosynthesis when leaves are absent; with age it turns to gray. The branches tend to be horizontal and are also covered with prickles. The leaves are composed of five to seven long leaflets. The flowers are creamy-whitish in the center and pink towards the tips of their five petals. 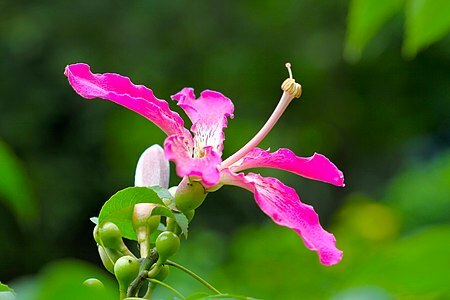 They measure 10 to 15 centimetres (4 to 6 in) in diameter and their shape is superficially similar to hibiscus flowers. Their nectar is known to attract insect pollinators, as well as hummingbirds. C. speciosa flowers are in bloom between February and May (in its native Southern Hemisphere), but can also bloom at other times of the year. The flowers of the related C. chodatii are similar in form and size, but their color goes from creamy white centers to yellow tips. As a deciduous tree, it is completely bare of leaves and flowers during the winter months, especially when growing outside of its native South America habitat. The fruits are lignous ovoid capsules, 20 centimetres (8 in) long, which contain bean-sized black seeds surrounded by a mass of fibrous, fluffy matter reminiscent of cotton or silk. The cotton inside the capsules, although not of as good quality as that of the kapok tree, has been used as stuffing (density = 0.27 g/cm³). The wood can be used to make canoes, as wood pulp, and to make paper. The bark has been used to make ropes. From the seeds it is possible to obtain vegetable oil (both edible and industrially useful). 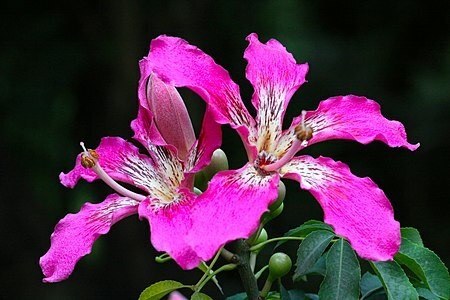 The silk floss tree is cultivated mostly for ornamental purposes. Outside of private gardens around the world, it is often planted along urban streets in subtropical areas such as in Spain, South Africa, Australia, northern New Zealand and the southern USA, although its prickled trunks and limbs require safety buffer zones, especially around the trunks, in order to protect people and domesticated animals from its prickles. Ceiba speciosa is added to some versions of the hallucinogenic drink Ayahuasca. Flowered pink specimen, in a road at Mogi-Mirim, near São Paulo, Brazil. Detail of the thorny trunk. An open fruit pod, displaying the silk-like fibers that give the tree its name, Silk Floss Tree. Winter time for a cultivated mature specimen at Huntington Library and Botanical Garden. Wikimedia Commons has media related to Ceiba speciosa. ^ "The Plant List: A Working List of All Plant Species". Retrieved 2 July 2015. Brief description of the tree. Subtropicals growing in Kerikeri - A report on C. speciosa as cultivated in New Zealand. 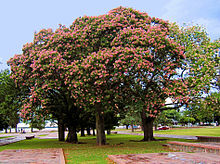 Ceiba gallery - Many pictures of trees of the genus Ceiba.